He’s regarded as Pompey’s prized asset and is destined to move up the Football League ladder. And Noel Hunt has always known Matt Clarke was going to fulfil his promising potential. It was at Ipswich when the former Republic of Ireland international first came across the centre-back. Hunt arrived at Portman Road on loan from Leeds in November 2014. At the time, Clarke was earning rave reviews as a youngster coming through the ranks at the Tractor Boys. The defender completed a loan move to Fratton Park in July 2015 before making his switch permanent the following summer as a makeweight for Adam Webster going the opposite direction. Clarke was reunited with his former team-mate Hunt, who was recruited by Paul Cook after spending 2015-16 at Southend. The pair would go on to help Paul Cook’s side be crowned League Two champions on the final day of the season. 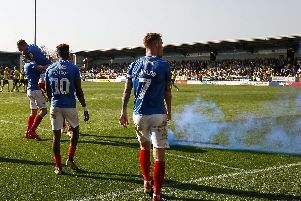 Hunt left the Blues shortly afterwards for Wigan, while Clarke has remained on the south coast and continued his hurtling development. The current News/ Sports Mail Player of the Season has been a vital cog during Kenny Jackett’s side’s League One promotion push this term. Clarke has made 41 appearances and scored three times, and has reportedly attracted potential suitors including Brighton, AFC Bournemouth and Bristol City. Championship football, at least, surely awaits him. And Hunt waxed lyrical about his former team-mate. He told The News: ‘When I was at Ipswich and Matt Clarke was at Ipswich when he was youngster, he was being raved about then. ‘He was 18 at the time and I thought “He is going to be a player”. ‘I was a bit surprised that they let him go on a permanent to be honest. ‘Obviously it has been Portsmouth’s gain and Ipswich’s loss. ‘He is a great lad and is still very young. People get muddled up by his hair line and thinking that he’s about 28! ‘But he’s not. He is a young lad and a great kid. He is hungry for success and is a real leader. ‘You know a good player when he makes the right decisions 99 per cent of the time. ‘You don’t see Matt Clarke making one mistake followed by two, three or four. ‘He’s always a constant seven or eight out of 10 and that is a good player for me. Hunt made 24 appearances and scored once during his season at Fratton Park. He left with a League Two winners’ medal and fond memories. Now assistant manager of Swindon, Hunt is hoping to be in the stands when Kenny Jackett’s side host Bristol Rovers on Tuesday. Hunt added: ‘I’m still in touch with a few people involved at the club because they are great people. ‘I always get down as much as I can. They play Bristol Rovers next week and I am thinking about getting down for that because we haven’t got a midweek game. ‘It’ll be nice to get down and see what the craic is.